Standard amenities include a hair dryer, refrigerator, TV, closet and bathroom with shower. Standard amenities include a hair dryer, refrigerator, TV, closet and bathroom with shower. A spacious picture window for memorable views. Standard amenities include a hair dryer, refrigerator, TV, closet and bathroom with shower. Balcony with 2 chairs and table. Floor-to-ceiling sliding glass doors. In Seattle you simply can’t skip the Central Public Library – a modern architectural marvel of glass grids, unusual shapes, and a “book spiral” that climbs four stories. Stroll over to Pike Place Market to visit the original Starbucks and play catch with a fishmonger. In the heart of the city lies Chihuly Garden and Glass, which will dazzle you with its colorful and delicate works. Glide to the top of the Space Needle for panoramic views of the surrounding mountain ranges and Puget Sound. *Price reflects sailing on October 20, 2019. Pricing is per person, double occupancy; USD. Taxes, Fees & Port Expenses additional: $195.00. ∆FREE MedallionNet™ for one guest (up to 4 devices per stateroom). Offer can be redeemed onboard and details will be delivered to the stateroom. MedallionNet offer available on 7-day Caribbean cruises onboard the Caribbean Princess® or Regal Princess®. The value for MedallionNet is not redeemable for cash and expires at the end of that voyage. Offer is not transferable and may not be combinable with other select offers or other onboard credits. All internet usage subject to Princess Cruises’ standard policies, which may limit browsing of sites due to network security and bandwidth usage. Applications that use high bandwidth may be blocked and offerings subject to change with or without notice. ‡FREE Stateroom Location Upgrade applies to booking the stateroom location you wish to sail in for the price of the lowest category within that stateroom type during this promotion only. Offer is based on availability in like to like stateroom types (Interior to Interior, Oceanview to Oceanview, Balcony to Balcony). Upgrade offer excludes select categories, including but not limited to premium categories and suites. Offer does not apply to land portion of a cruisetour. ††FREE Gratuities are based on the pre-payment, by Princess Cruises, on behalf of the guest for the suggested gratuities in the U.S. dollar amounts of $13.50 per guest per day for Interior, Oceanview, and Balcony staterooms, $14.50 per person per day for Mini-suite and Club Class staterooms and $15.50 per guest per day for Suites. This amount is paid on the behalf of all guests (up to 4) in a stateroom only. Free gratuities do not include gratuities added to bar charges, dining room wine accounts or Lotus Spa services. Gratuities are not transferable, nonrefundable, have no cash value and may not be combinable with other select offers or other onboard credit. ‡‡FREE Onboard Spending Money $800 per stateroom is based on voyage length and stateroom type. 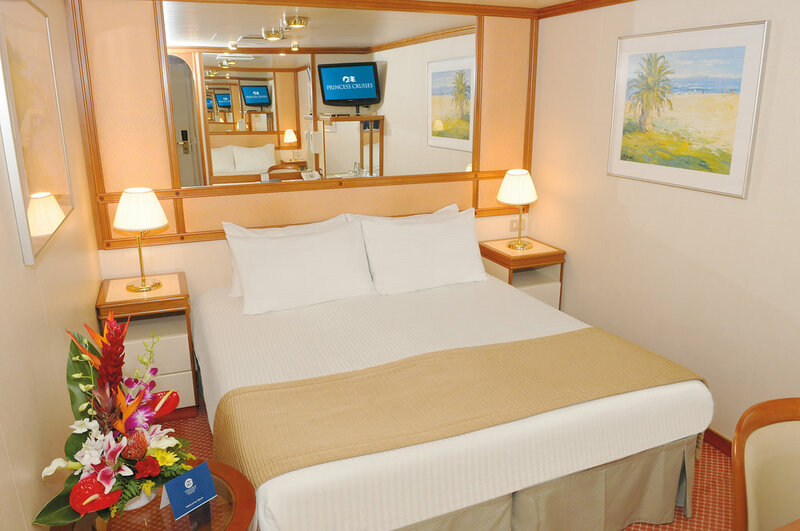 Offer is applicable to all guests (up to 4) in a stateroom. Guests with single occupancy will receive double the per guest credit amount. Spending money may be used on a single voyage only, is not redeemable for cash, cannot be used in the casino and expires at the end of that voyage. Offer is not transferable and may not be combinable with other select offers or other onboard credits. Onboard spending money is based on the ship’s onboard currency.